6. Kaju - 8 soaked and make a paste of it with little water. 1. Mix kheema, chanadal, chilli pwd and salt in 2 cups of water and boil it on medium flame with lid closed for 30 mins. 2. Strain the water and let it cool. 3. Make a fine paste of the above mixture in the mixer (try to use the pulse mode) with kaju paste and egg white. 4. Take it out in a bowl, add garam masala pwd, ginger garlic paste, corriender, pudina, turmeric pwd and mix it with a spoon. 5. Make slices of boiled egg. 6. 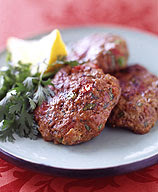 Take the mixture and insert one sliced egg in the centre and give it a shape of the kabab( round shape). 7. Roll the kababs in the dry maida flour and swallow fry it in a frying pan or deep fry it. Fry it till its golden brown on both sides. 8. Serve hot with lime and onion slices. Can be eaten as a snack. Hi, looks great.Bet it tastes good too.You could send this to JFI Ginger,you know.Details at Indira's.Enjoy. i like to know ,instead of cooking mutton and other ingredients in a vessel for30mintues ,we can put in pressure cooker for 3 whistles. Thanks Asha, Nidhi for visiting. Great !!!! Another one to try, will have to do it very soon. Thank you so much for the recipe.